Part two of “THE FALL OF THE BLUE LANTERNS”! Why is every CORPS coming apart at the seams? One word: LARFLEEZE! Cover- A defeated and bloody Saint Walker lies on the floor as a member of the reach stands above ready to deliver the finale blow. 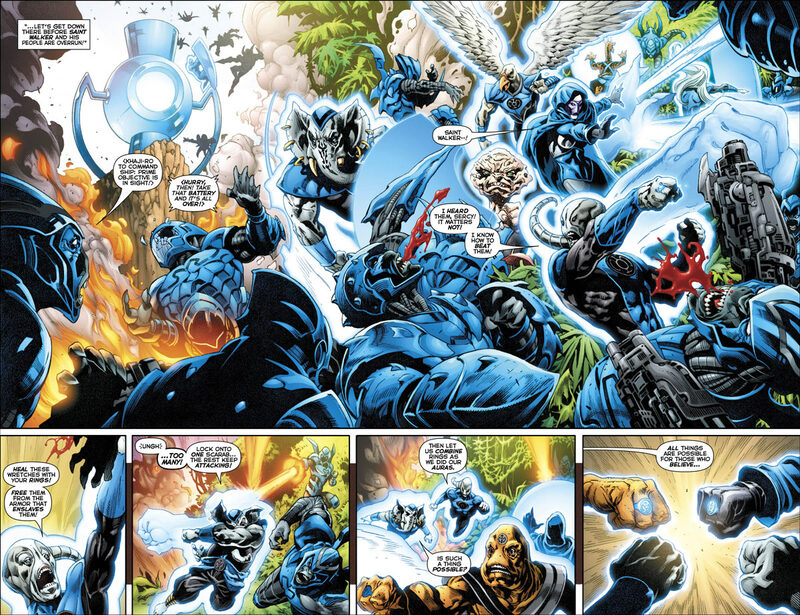 Blue Lanterns-Since their debut I’ve like Saint Walker and the concept of the Blue lanterns powered by hope and these last two issues have shown the full scope of their abilities, the strengths and weaknesses inherent in it and why Saint Walker is a near Christ like figure among them. 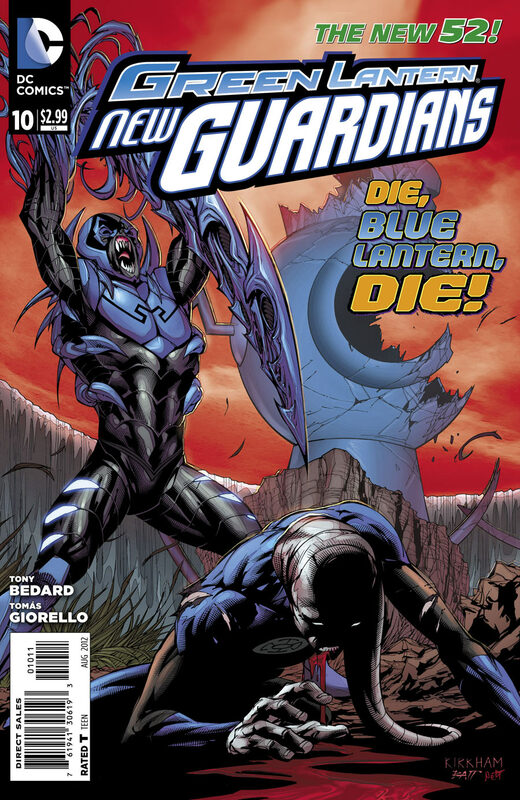 This issue also leaves just a handful of Blue Lanterns to rebuild their faith….with Ganthet or Sayd the guardians who created them. It was this realization which was most heart wrenching that Ganthet, lobotomized and stripped of emotion and Sayd now bound and enslaved by Larfleez have had their legacy, one created through their love is now practically extinguished. Luckily a few seeds remain so the garden may once again flourish. Villains- the Reach proved to be an overwhelming force these past two issues. The insect like swarming of the planet the scope of their power and how well executed their plan was. It all adds up to a very tense and hopeless war complicated as different colored lanterns show up. Team- Every issue the team comes together more and more. Fatality and Kyle enter orbit almost in time to rally the bearers of Hope while Arkillo the only remaining Yellow Lantern with a new prototype ring is having a few “hiccups”, all in all though everyone is now primed and ready to finally take on the sole wielder of the Orange light. Art-Thomas Giorello is on art duties and it’s a downgrade for this book. Tyler Kirkham where art thou? Even the once vibrant colors seemed dull and lifeless this issue. What happened Dc?